Graphene: The Next Super Material for the Communications Industry? There has been a great deal of interest in Graphene. Some would call it hype. But with its flexibility and heat conduction properties, this atom-thin layer of carbon, which has been touted as the strongest material ever measured, has enormous product and market potential for the ICT industry. Because graphene is conductive at nano-scale layers, it can be used for lightweight, flexible yet durable display screens, electric circuits and solar cells. It is also currently being made into inks and 3D printable materials. Imagine what this can mean for the design of communications devices, or circuitry, or batteries. Imagine the impact on wearables, the design and development of IoT sensors, or large scale retail store windows. Graphene holds a great deal of promise. Despite the potential graphene promises, it has taken longer than expected to transform research and development into commercialized product. This webcast will explore both the tremendous potential harbored in those structured carbon atoms and the business reality. The focus will be on the use of the material for the ICT industry. We will also look at other use cases that may be the first steps on graphene’s path to commercial application. - Anthony Schiavo, Research Associate, Advanced Materials Team, Lux Research, Inc. 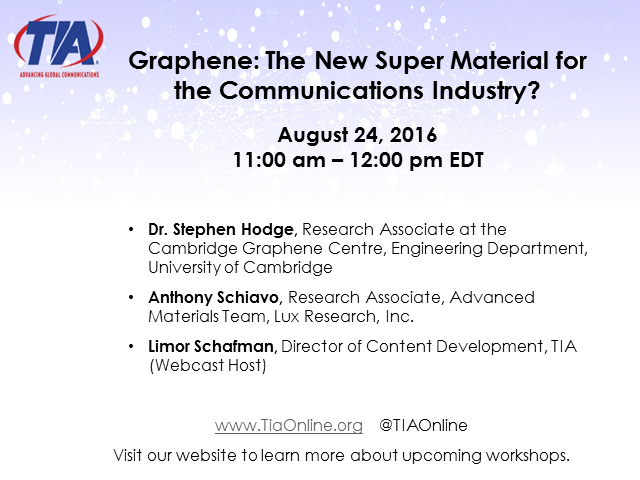 Title: Graphene: The Next Super Material for the Communications Industry?